Cops save the day, we can sleep peacefully! Most of the time what makes for a good demo isn’t the actual participants but the response of the boys with big feet who by prowling the beat are protecting the peace of the nation! 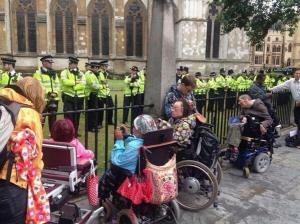 This image from yesterday’s demo nicked from Ian Bone’s website Anarchist in the UK without asking! That’s what we anarchists do! So there! If it weren’t for the boys in blue..er..yellow..these trouble makers could have caused a scene! So try and keep calm when they’re twisting your arm or planting a fist in your gob.. When they’re kicking you to hell in a cold prison cell..
They’re only just doing their job! ← What all footballers should be wearing?